We are so honored to have the Hortense Beck exhibit in our gallery. The quilts are absolutely breathtaking and all of them tell a story. The AccuQuilt Gallery welcomes the Hortense Beck Quilt Collection, an exhibition of historical reproduction quilts. The collection is from the late Hortense Horton Beck (1920 - 2009), a woman who began sewing and quilting at the age of 60 after learning how to appliqué and falling in love with it. The exhibit will run until May 25. With an enormous passion for American history and inspiration from her museum visits as well as what she saw in publications, Beck made it her mission to interpret and recreate some of the most significant quilts in American collections. Beck made the quilts for her own enjoyment but eventually wanted the general public to enjoy them as well. 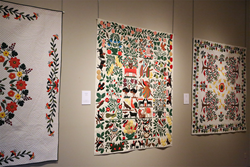 It was especially important to Beck that her quilts were easily shared and that people could get up close and personal to them, since many museums did not generally offer that luxury and often kept the original quilts stored away. In addition to designing her own quilts, Beck spent 30 years replicating historical album appliqué quilts as well as picture quilts that tell a story about their time in history. Appliqué quilts in the Baltimore Album, patriotic, and African-American styles were of particular interest to Beck. The Hortense Beck Collection is the only preserved collection of reproduction quilts made in the last quarter of the 20th century. Some years ago, Beck donated her large quilt collection to the International Quilt Study Center and Museum at the University of Nebraska in Lincoln, NE. The IQSCM is home to the largest publicly held quilt collection in the world. “We are so honored to have the Hortense Beck exhibit in our gallery. The quilts are absolutely breathtaking and all of them tell a story. We know our visitors will be impressed as seeing these quilts in person is almost overwhelming. You can immediately see how much work went into them,” said Steve Nabity, AccuQuilt Chief Energizing Officer. Measuring over six feet in height, seven of Beck’s reproduction quilts are on display at the AccuQuilt Gallery: Strawberry (1983), Indiana Wreath (1984), Stars and Stripes Forever (1986), Bird of Paradise (1988), Cherry Trees (1992), 1830 Album (1997), and Mary Simon Baltimore Album (2002). Visitors can view the Hortense Beck Exhibit at the AccuQuilt Gallery, Monday through Friday from 10:00 a.m. – 4:00 p.m. Admission to the Gallery is free. Additionally, visitors can tour the AccuQuilt headquarters and Dream Studio during their visit. They can reserve a tour in advance by calling 888.258.7913 or by emailing tours(at)accuquilt(dot)com.